When Missy Moo calved back in October last year, I wondered how long we would milk her. We thought we'd be able to milk her for longer than the 10 months we enjoyed, but the weather has had it's way and when Missy began to start rapidly losing condition, we had to put the health of her and her unborn calf before our own needs. We dried her up at the end of August, and since then she is back to being naturally parasite free, sports a glossy coat and is putting weight back on. If we had continued to milk her through this dry weather, we would have had to be pouring a huge amount of feed and supplements into her, and even then I think her body would have given the extra protein to her the calf she is pregnant with, as well as made more milk with it. It's the way their bodies are designed - their baby comes first, only her body doesn't know the difference between us taking milk and a calf. Having our own milking cow is a goal we'd been aiming at for ages and to have finally reached it is a big achievement in my opinion. Milking Missy has been an incredible journey and a huge learning curve. Now we own two dairy cows, hopefully one day we'll be able to enjoy our own milk year round by staggering Missy and Clara's calving times. When we weaned Missy's calf Smokey back in Autumn, it commenced a new stage in our milking journey. We went from milking once a day, and skipping the odd day if things got on top of us, to milking twice daily with no option not to as there was no calf to take care of the surplus milk. It was really enjoyable to have so much milk during that time, it was like being back to when Smokey was newborn. We were making cheese all of the time, drinking as much milk as we wanted, feeding it to the dogs and pigs, and has so much cream we were using it fresh as well as making cultured butter. Since we have only recently dried up Missy, I thought now would be a perfect time to share a few things I learnt as a first-time milking cow owner. 1. Milking is harder than it looks. My hands ached from RSI for the first week, as they were of course, not used to the milking action and thus "unfit"! Milking is also far more relaxing than anyone tells you, and when everything goes right it really does feel like you're living the dream. 2. You'll inevitably end up crying over spilt milk at some point. 3. Sprouted grains and dried nettle leaves are your milking cow's best friend. I've already written about the increase in the nutritional value of sprouted grain here (and how to sprout them), but I haven't mentioned nettles. You'll find comprehensive information on all herbs, including nettles, in Isabell Shippard's book, but in short nettles are high in protein (40%), rivalling that of other popular cattle supplements, and they are a natural milk stimulant. 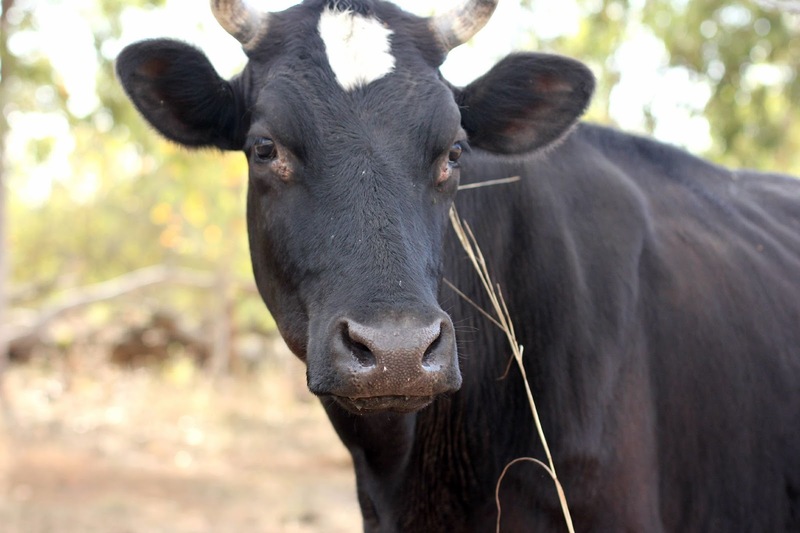 Adding sprouted barley and dried nettles to Missy's food daily not only increased her milk supply, it kept her healthier and helped her keep weight on too. 4. You don't need to separate mother and baby overnight in order to get a decent amount of milk. We milked with the calf on 24/7 for the first three months. Once Smokey was over that age he was getting quite big; we found it necessary to separate him from Missy for a couple of hours*. We had several changing routines as Smokey grew and changed, but in conclusion we only ever had them apart from each other for a few hours a day, as opposed to 10-12 hours overnight. I don't think overnight separation is in any way cruel, but I was comfortable with our method and we'll most likely be following the same routine next time Missy calves. I found the milk drought at it's worst just before we weaned Smokey. He'd found sneaky ways to get to Missy even after we'd separated her. Of course once we weaned him we had to milk twice a day, every day, and the yield increased to 8+ litres daily. *Please note that the extent of separating Missy was merely to pop her into the adjoining paddock. You should never separate a calf and mother so that they can't be in sight of each other, or have them further a part than the width of a small lane-way between paddocks. For obvious reasons not being within sight of each other is incredibly distressing to mother and calf! Is it a dream of yours to keep a cow for milk one day? Perhaps you already have a milking cow and have some handy hints of your own to add? Goats seem to be tough little things, I've often thought of keeping one for milk. I find all this absolutely fascinating. If we ever get the small holding we dream of we hope to have a milking cow ... I'll know where to come for tips! :) Random cheese making question... Did you find any great ways to use your whey other than sharing it with your livestock? I feel so bad about wasting it, but struggle with good uses for the (acid) whey when we make our simple cheeses. I know you were experimenting with cooking and fermenting - any great outcomes? I have used some for baking and dog treats, but nothing too exciting (yet!). Do you mean whey from cheeses such as ricotta (whey with vinegar in it) or whey from cheese made with cultures? The Ricotta whey I used to feed to the chickens, but the cultured whey has heaps of uses. I used it to lacto-ferment cucumber pickles (using the recipe in Sally Fallon's Nourishing Traditions) And it was also great added to bread dough - produced the best, fluffiest rolls! That's about all I ever did with it, although I'm sure there are heaps more uses. Thanks, Sarah! I haven't been brave enough to culture anything yet, so just acid whey from vinegar/lemon cheeses like ricotta, queso, paneer, etc. I'll keep experimenting with baking substitutions, but not yet in bread and apparently its great for soaking grains/beans before cooking, so maybe I will try and time the next batch of cheese with some cooking.